Wishing You All Happy Holidays and a Wonderful New Year! As we wrap up 2013 and look ahead to a new year, please consider giving to PathWays PA this holiday season either using Amazon Smile or Just Give! If you are making holiday purchases through Amazon.com this year, use AmazonSmile when you buy! If you register at AmazonSmile, .5% of your purchase will be donated to PathWays PA.
Once you register your account, please continue to sign into Amazon using smile.amazon.com so that PathWays PA continues to get contributions. If you would like to donate to a specific program at PathWays PA, you can use Just Give by visiting our page here. Just Give allows you to see specific needs and programs that you can give to once or on a rolling basis! Fill out the application for NEPA or Fill out the application for Lehigh Valley.Commit to the classroom training.Be willing to conduct at least 1 training or outreach activity per month for 12 months following your certification.Agree to offer your trainings free of charge (excluding the acceptance of travel reimbursements). Here's how it works: Once your application is approved, you'll be trained by PHAN staff on the law and best practices for public education. We'll also supply you with a resource guide book and a slideshow. The Philly DoGooder Awards Are Back! Once again, Generocity.org is teaming up with Here's My Chance for an even bigger, better, video challenge. Each week, Philly DoGooder will keep you updated on the organizations involved in this year's Philly DoGooder contest, and sending shoutouts to all of the groups that participated last year. They are looking for community-based organizations (nonprofits and for profits), filmmakers, and sponsors to get involved- visit http://phillydogooder.com for all the information you'll need! A webinar will take place on Thursday, December 19 beginning at 4PM EST to discuss the federal budget deal. Congress is expected to finish work on a bipartisan budget agreement next week. The bill as passed by the House will make it possible to start to reverse cuts to Head Start, senior meals, housing and many other needed services. But it asks federal workers to pay much of the cost, while not saving one dime from closing corporate tax loopholes. And it leaves out the renewal of federal unemployment insurance. That failure means that on December 28, 1.3 million long-term unemployed people will immediately lose UI. If the expiration remains in place throughout 2014, more than 4 million people will lose access to UI. More than 1.3 million Americans will be totally cut off of their federal unemployment benefits three days after Christmas, and nearly 2 million more will not have access to those benefits by mid-2014 once their state unemployment benefits end, unless Congress renews the federal Emergency Unemployment Compensation (EUC) program before it expires on December 28. The House of Representatives is scheduled to adjourn and go home for their holiday recess this Friday, December 13, leaving only a few days this week to renew federal EUC benefits for millions of unemployed jobseekers. Call toll-free 1-888-245-0215 and ask Congress to renew unemployment insurance for millions of unemployed this holiday season. Please join Children's HealthWatch and the Center for Hunger-Free Communities for a webinar featuring the release of a new report: "Punishing Hard Work: The Unintended Consequences of Cutting SNAP Benefits." The report details research findings on a phenomenon known as the "cliff effect." The cliff effect is an unintended consequence of the way SNAP (the Supplemental Nutrition Assistance Program, formerly food stamps) benefits are calculated - modest increases in household income trigger significant reductions in nutrition assistance benefits leaving young children in poor health and without enough food to eat. Please RSVP for the webinar here. Sen. Gillibrand and Rep. DeLauro to Introduce FAMILY Act Thursday! Paid leave champions Senator Gillibrand and Representative DeLauro are set to introduce the Family And Medical Insurance Leave (FAMILY) Act, a national paid family and medical leave insurance program that would provide workers with up to 12 weeks of paid leave. The legislation will be introduced this Thursday, December 12 on Capitol Hill. Please take a moment and ask your member of Congress to be a cosponsor the FAMILY Act bill. Ask Governor Corbett to Expand Medicaid! Health care reform gives Pennsylvania tens of billions in federal funds to expand Medicaid to low-income workers - but only if we accept the money. Every state that touches Pennsylvania - including Ohio and New Jersey have agreed to expand. Governor Corbett recently came out with a proposal that will help hundreds of thousands of people get access to health care. However, this proposal is long and complicated and could take over a year to implement. Ask him to expand in 2014! Sign the card to Governor Corbett with the message to expand Medicaid NOW. Tomorrow is Pennsylvania Anti-Trafficking Day Advocacy Day in Harrisburg! For those who are unable to attend the Anti-Trafficking Advocacy Day, please call your legislator and voice your support for SB75 to strengthen PA law to better prosecute traffickers and protect victims. Pennsylvania currently lacks the laws necessary to efficiently prosecute human traffickers. SB75 is vital to beginning the process in Pennsylvania of protecting victims and successfully going after traffickers. You can use this script when calling and find your legislator by inputting your zip code. The Federal Budget Conference Committee has been charged to come up with a budget plan by December 13. More than ever, it is important to make sure Senators and U. S. Representatives know the impact these cuts have had on human needs programs. PBPC is encouraging State Organizations in Pennsylvania to sign a state letter showing their support for a budget that protects vulnerable low income families. The letter, drafted in partnership with the Coalition on Human Needs, calls on Pennsylvania's Congressional Delegation to insist on a budget plan that ends harmful sequestration cuts and reduces spending on federal credits, deductions, and other tax breaks. In addition, please distribute the letter to your state partner organizations to sign. If you plan on doing holiday shopping (or any shopping) on Amazon this year, please consider doing so through AmazonSmile, and Amazon will donate .5% of your purchase to PathWays PA! You can register for AmazonSmile for free at http://smile.amazon.com/ch/23-2001837. After you register, next time you shop on Amazon, start out at smile.amazon.com. Please share this great donation tool with your friends! PathWays PA is pleased to announce a grant from Bank of America to support our Girls SHElter for runaway teen girls. The girls served through the SHElter have been thrown out of, or have left, an unstable and/or abusive home environment. Many have experienced emotional, physical and sexual abuse; and have witnessed domestic violence in their home. To survive on the street, the girls are at risk for involvement in high risk activities including drug use, prostitution and human trafficking. The SHElter helps to save the lives of teen girls by preventing their involvement in these activities. SNAP Nationwide Call-In Day is Happening Right Now! Call toll-free to 1-888-398-8702 (Toll-free number provided by Feeding America)A pre-recorded message will ask you to enter your zip code. Press 1 to be connected to your Representative.Let your Representative know you are calling about the Farm Bill and deliver this important message: "As your constituent, I urge you to support and protect SNAP in any Farm Bill or other legislative vehicle. Oppose SNAP cuts. "Call back to repeat the process for your two senators. Press “2” to be connected to your first senator and “3” to be connected to the other. NCHE is hosting a webinar on December 11 beginning at 2:00PM. The holiday season is upon us, and many of you are likely making plans with your families to celebrate the year that has passed and the year to come. But for many homeless women, children and teens in our communities, the holidays are like all other days - filled with uncertainty and fear. Today, on Giving Tuesday, we hope you will take a moment to think of the countless families that will not share in happy holiday celebrations and give them a gift that leads to self-sufficiency. At this special, gift-giving time of the year, we are asking for your gift - not for us but for our families. Please assist us in supporting the women and children in our care, who will spend the holidays without a home or loved ones to keep them warm. Many of our clients have been neglected, abused and have nowhere to go. PathWays PA gives them the stability and security they need to begin to rebuild their lives and care for their children. PHI (Paraprofessional Health Institute) and NELP (National Employment Law Project) are offering a webinar tomorrow at 2:00PM to explain and answer questions about the final rule extending minimum wage and overtime protections to home care and the impact it will have for home care workers, services and the industry. Celebrate the joy of giving this holiday season with a donation to PathWays PA! We are one of Greater Philadelphia's foremost providers of residential & community-based services for homeless & low-income women, children & families, serving over 4,500 each year. Our full complement of social services focuses on developing self-sufficient lives & leads to the fulfillment of our mission: To help women, children, teens & families achieve economic independence & family well-being. Your donation will provide many wonderful things like: basic necessities for a homeless baby, a bed for a homeless mother, and food for a mother and her children. 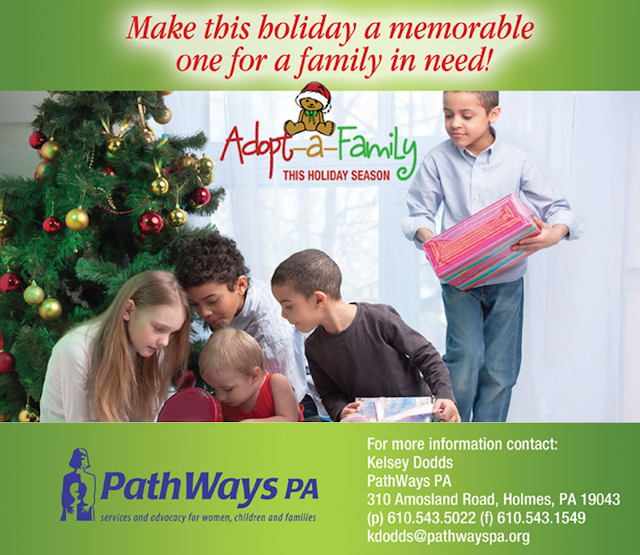 PathWays PA Adopt-A-Family Holiday Drive Has Begun! Our Adopt-A-Family yearly holiday drive allows those who want to provide gifts to families and children in need the opportunity to be matched with our clients. Many of our clients are working toward self-sufficiency and family well-being, but at this time, can not afford gifts for their children. With your help, we can make this holiday and wonderful time of the year!